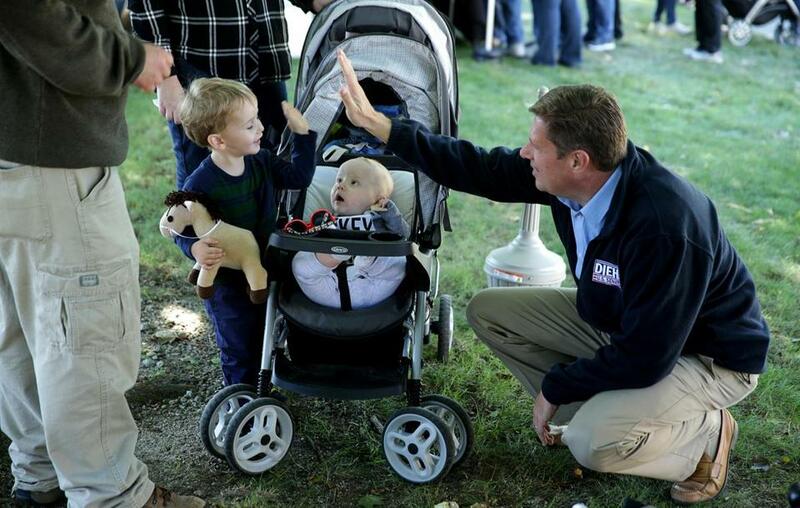 Geoff Diehl greeted Gordon Bennette and his little brother, Wilson, at the Cranberry Harvest Celebration in Wareham on Saturday. From the start of his campaign, Geoff Diehl has warned voters that their current senator, Democrat Elizabeth Warren, is more interested in running for president than serving the people of Massachusetts. Then she made his argument easier, acknowledging from a stage at a town hall in Holyoke that she is in fact considering a run for the White House. In the week since, Diehl has sought to capitalize on her headline-grabbing announcement by hammering the message that Massachusetts deserves “a full time senator” in Washington, not a presidential aspirant. He called on her to drop out of the race and has hit on the theme again and again as he stumps around the state. Warren won’t help veterans, she’ll be running for president, he said outside the Bedford VA Thursday. Warren will be too focused on her 2020 campaign to give Taunton the attention it needs dealing with infrastructure and opioid problems, he said there Tuesday. Warren has responded to Diehl’s criticism by stressing that she has only said she will consider a presidential run, not that she is definitely doing so. “As I said, I haven’t made up my mind,” she said last week in an interview on WGBH. Diehl says voters come to him with their concerns about Warren’s ambitions. “The general feedback I seem to get is that people feel like Senator Warren is not focused on the job of senator, but that she wants to be making this run for president,” he said during a campaign stop Saturday in Wareham at the 15th annual Cranberry Harvest Celebration. As Diehl shook hands and spoke with voters, conversations focused less on Warren’s plans than on lighter topics such as which vendors had the best food. Diehl appeared relaxed as he discussed the upcoming Red Sox game or his experiences as an Eagle Scout with members of the crowd, including several who expressed disdain for his opponent. After a lengthy conversation with Diehl, William Wayne said he will vote for him next month, but not because of any concerns about Warren’s potential run for president. “She does what she wants when she wants and how she wants,” said Wayne, 71, of Marshfield. Diehl’s attacks are a smart tactic, strategists and other observers say. “Being a candidate for the presidency is a full-time job, and it detracts from your work as an elected official,” said Ryan Williams, a Republican strategist and longtime aide to former governor Mitt Romney. But Diehl, a Whitman Republican, still faces a tough task beating Warren. Public opinion polls consistently show she enjoys a hefty advantage over both her challengers, Diehl and Shiva Ayyadurai, who is on the ballot as an independent. “If there was anyone else delivering it from a more moderate, middle-of-the-road political inclination, this would have resonance among Mass. voters,” said Thomas J. Whalen, a Boston University political scientist. But Diehl, who of the three Republicans to compete for the party’s Senate nomination most enthusiastically embraced President Trump, is too out of step on policy and politics with the median Massachusetts voter to appeal, he and other analysts say. “The fact that he has wholeheartedly in the bluest of blue states embraced Donald Trump and his administration’s polices, I think it’s going to fall on deaf ears,” Whalen said. Instead, the 30-second ad accused Warren of calling “police officers racist from front to back,” referring to remarks Warren made at a historically black college in New Orleans this summer. The comment still angered some local law enforcement. It’s another line of attack Diehl has pursued, touting the endorsement of various law enforcement organizations, such as the Boston Police Patrolmen Association this past week. On Saturday, Diehl’s campaign announced the endorsement of the Boston-based National Immigration and Customs Enforcement (ICE) Council Local 207. Warren’s remarks in New Orleans stuck with Janis Smith, 68, of Wareham, who has a brother who is a police officer. Smith, who is a registered Democrat but votes for candidates from both major parties, including Trump, said she is frustrated with Warren and other Democrats “lumping women together” and assuming that female voters all share similar views or values. “She’s not in touch with the real people,” she said. Smith is also concerned, she said, that Warren’s eye for higher office means she’s not focused enough on the work of the Senate.